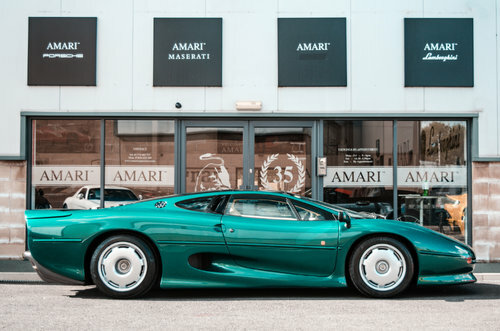 The story behind the Jaguar XJ220 is an inspiring one. 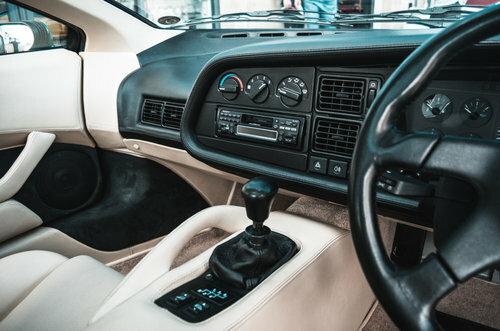 Professor Jim Randall, the head of Jaguar's engineering department, started the ball rolling by sketching out some ideas whilst on a Christmas holiday in the 1980s. It was the stuff of fantasies - V12, 4WD, slippery body with ground effects. Together with colleagues in the 'Saturday Club' at Jaguar (so called because they met out of hours and at weekends to work on unofficial pet projects) they toyed with the concept until Jaguar started getting genuinely excited by the idea and official plans were put in place to build what was to be the fastest ever road car. 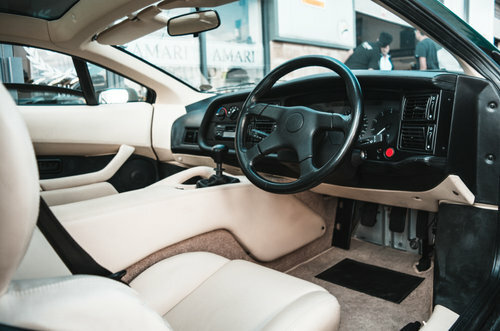 The Birmingham Motor Show in 1988 saw the unveiling of the powered concept with the design featuring a V12, fuel injected, 48 valve 530BHP engine delivering its output to all four wheels. Ultimately, the use of the V6 allowed the chassis to be shortened, although the proportions of this car are still truly impressive. The engine sits behind the two seat cabin, with a tiny boot available behind that. The styling is heavily influenced by the need to cool the highly tuned engine and also to provide sufficient downforce to keep the car steady at the 217mph top speed. 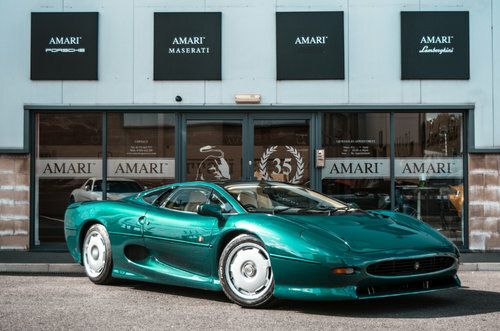 There's no doubt about it, this car is as visual as it is all about power, it may be 20 years old, but this Jaguar still holds its own in the era of the Hypercar. Turn the ignition key, hit the starter button and behind your head the Group C derived V6 bursts aggressively into life, harsh metallic whips of sound lash wildly from the engine bay, it's a noise straight from the Le Mans pit lane. Once up to speed it becomes addictive to lift off the accelerator and listen to the frenetic mixture of turbo waste gate chatter. Continuing to feed power through the gearbox only results in more drama as it reaches the limits of its abilities before the brace of mighty turbochargers reach full compression and the seductive noise dissipates into an aeronautical gale of vast quantities of air being manipulated both around the high-downforce body and through the engine. 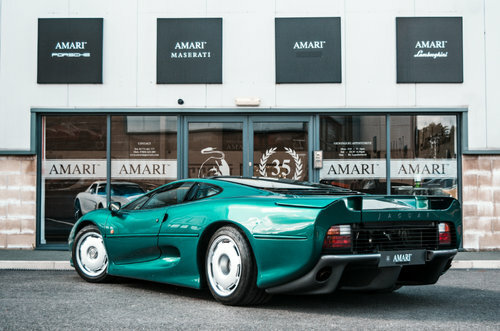 Make no mistake this car has the looks to match, the metallic green paintwork is absolutely stunning from any angle thanks to the fact that this particular XJ220 was the subject of a hugely expensive glass out repaint in 2007. It was also decided at the same time an internal retrim was in order; the nett result is a car that looks better than the day it left the TWR factory. The odometer currently shows a speedo reading of just under 6000 miles and is supported by MOT certificates dating back to 2002. 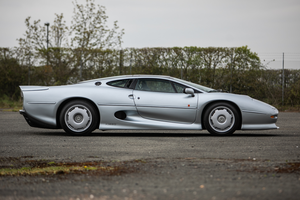 We are reliably informed that this particular XJ220 has had work done by probably the UKs leading authority on XJ220s namely Don Law based of Staffordshire. This included in the summer of 2015 included a full overall at considerable cost, in which, a 24 month service was carried out along with replacement of the clutch, fuel tanks and pumps. Since then the car has travelled less than 500 miles. Other than trips to the MOT station this car has had little use over recent years. Sold with its original factory hand pack and supporting documents. 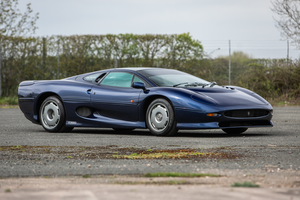 Only 281 of these Jaguar icons were ever built and contrast with todays standards of automotive restraint and green manufacturing; which makes all the more sense to buy one whilst you still can. 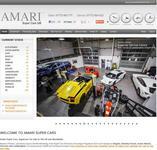 Please note the car will be supplied with a fresh 12 months MOT and service. The car sits on Bridgestone Potenza Tyres all around.